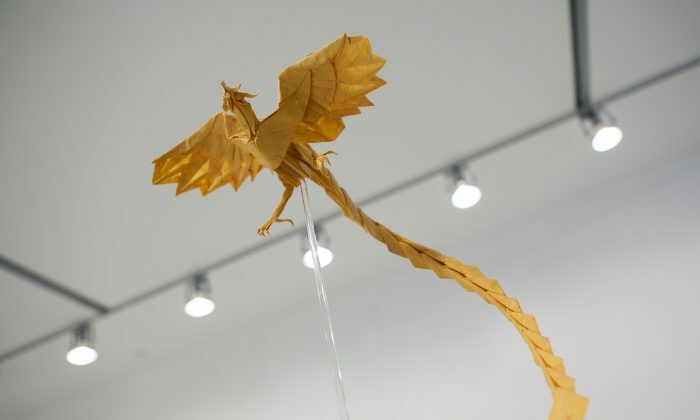 NEW YORK—If you, as an adult, still pride yourself for remembering how to fold an origami crane or a samurai hat, here’s an exhibit that will humble and inspire you. The U.S.’s first origami exhibit took place 55 years ago at The Cooper Union for the Advancement of Science and Art (Cooper Union). Surface to Structure is a reappraisal of that exhibit, and in 134 works by 88 artists, shows how origami design has evolved with the use of imaging software and complex mathematics. “One of my goals is to break down what the traditional perception of origami is—that it’s this simple paper craft when in actuality it can be a much more serious art form,” said exhibit curator Uyen Nguyen. Like most children, Nguyen had folded paper planes and other simple items, but she only became earnestly interested in origami during her mechanical engineering program at Cooper Union. For her senior project, she worked on a design for an origami stent that would self-unfold and expand to hold open an artery. Though the project didn’t totally pan out that way, she came away feeling enriched in her appreciation of origami’s more technical aspects. American origami master Robert Lang wrote software called Treemaker that allows him to generate a printable crease pattern from a rough drawing. His pieces in the exhibit include a peregrine falcon, a turkey vulture named Richard, and a surprisingly lifelike yellow jacket. Several of the pieces are displayed with printouts of their patterns so that viewers can appreciate the sheer number of mountain folds, valley folds, and axial folds needed to build one little insect or bird. Martin and Erik Demaine, father and son MIT professors, create undulating sculptures that begin with concentric circles scored into paper. For them, origami is a way to understand the applications of curved creases in manufacturing and engineering. “The mathematics of curved creases is not yet as defined and known as linear creases and that’s one of their subjects of interest,” said Nguyen. Several artists applied math to modular origami, built by interlocking multiple units of folded paper. Others tessellated their designs on a flat surface. Thomas Crain created a set of baskets that looks as if each basket was woven from strips of paper, but the baskets were actually folded and tessellated to form the basket weave pattern—which is nothing short of black magic to the uninitiated. To understand the logic of these particularly complex structures requires some of the artists’ technical acumen from the viewer. But all of it is visually stunning and requires no computation to appreciate. In Japanese, “origami” literally means, “folding paper,” but that doesn’t mean that the principles of origami aren’t applied to other media. Tomohiro Tachi from Japan laser-cut a sheet of metal according to an origami pattern and wrested it into something that resembles an angular version of Anish Kapoor’s “Cloud Gate” in Chicago. A section of the exhibit deals with fashion, which, granted, has its own legacy of using folding to coax flat surfaces into shapely, wearable garments. The dresses and accessories here either borrow elements directly from origami or are created entirely of folded paper, as in the case of Jule Waibel’s Entfaltung dress. An accompanying video shows a model dancing in the dress. As she moves, the complex shapes comprising the skirt buckle and swell, calling to mind a bird-of-paradise’s mating dance. The most high-tech piece in the exhibit would be Matthew Gardner’s “Oribotics,” which combines origami with robotics. Three paper flowers controlled by motion sensors open and close as visitors draw near. Yet for all the technology involved in contemporary origami, there’s no replacement for the human hand. Most origami is still done fold by exacting fold. Only more proof for the old adage that technology is only as smart as its user. Here's a look at three artists whose realism is astounding and whose methods to achieve such realism using the medium of paper are innovative.